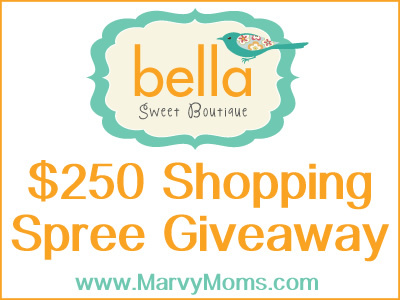 Bella Sweet Boutique is raffling off a $250 shopping spree to their online store and has invited Marvy Moms to share with our readers! Bella Sweet Boutique is run by women that find things they love and sell them at the best possible prices to their customers. Check out their store and you’ll find fashions, accessories, home décor, and distinctive tech gear. Hoping one of our Marvy Moms readers will be the lucky winner! Marvy Moms has not received any financial compensation whatsoever for posting this raffle, we just thought it was too good to not share! Winner is scheduled to be announced Monday, July 8, 2013.